The pygmy sperm whale is one of three species which belongs to the sperm whale family. 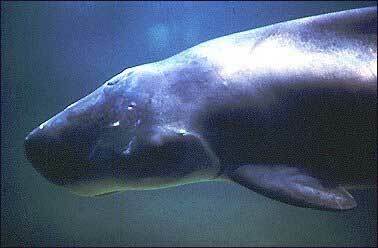 Like the sperm whale it has a square head but is considerably smaller in size. The upper jaw lacks in teeth, which distinguishes it from the dwarf sperm whale. Both species are able to release a reddish brown substance before diving. They live alone or in small groups up to 5 individuals.